A long time has passed since those amazing times of the birth of Solidarity. 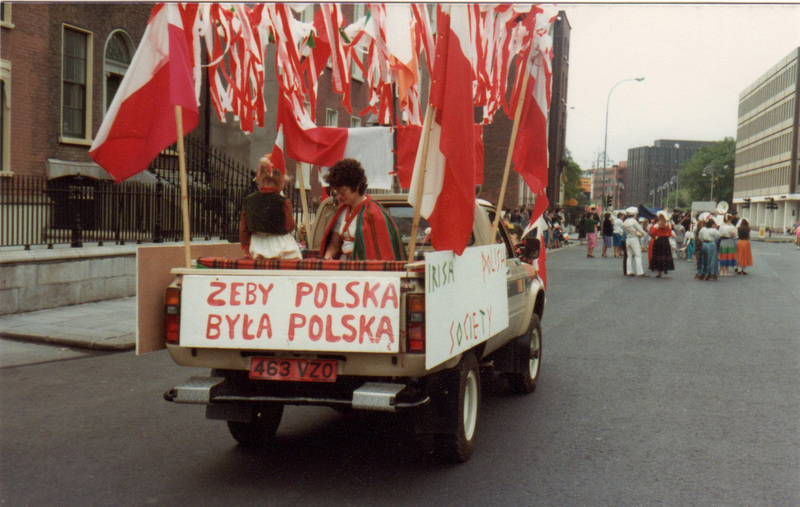 Before that time, and when there were very few Poles in Ireland, people used to ask me: “when do you think Poland will be free?” and I used to reply: “not in my lifetime”. But history is full of surprises and it did happen in my lifetime. It was an exciting time for us and we lived those moments with great intensity. I shall speak of events as I have recorded them. I left the Polish priests to Maynooth and returned home at 2.00 a.m. My husband was listening to the radio. He told me the chilling news that martial law had been declared in Poland. Concelebrated Mass for Poland in the Pro-Cathedral by Polish priests and Fr. Dowling. Our Chairman, Maciej Smolenski makes a moving speech about Poland and the attitude of the West to events in Poland. We organised two protests outside the Russian Embassy, with banners, candles and heartfelt speeches. 7 February 1982.All Priests' Show w Olympia Theatre. The goodwill of the performers and packed audience were palpable . 7th March 1982. Chopin Concert in the National Concert Hall performed by the acclaimed Miceal O'Rourke. Wanda Wilkomirska, the famous violinist, appears on the Late, Late Show and speaks about the Polish situation and mentions our concert which was to take place the following day. 3rd May 1982 - Pirates of Penzance-Gala Performance in Olympia Theatre. Where did the aid go? 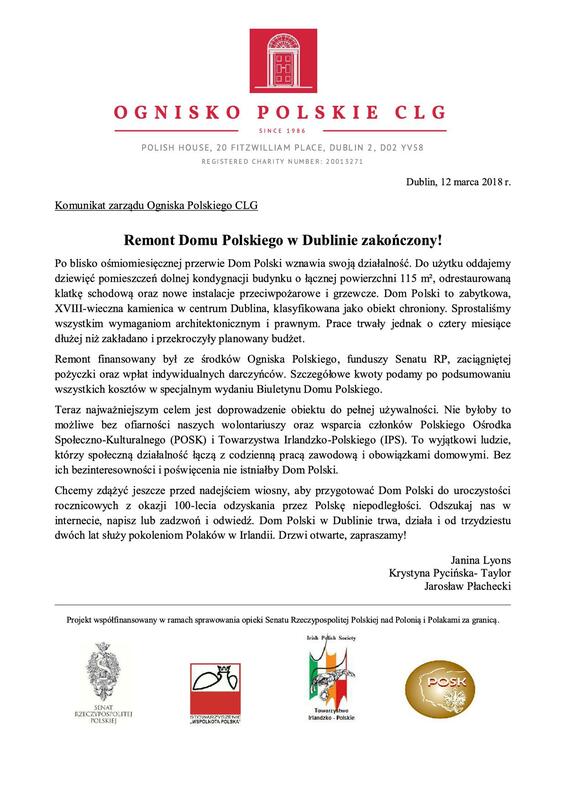 To the Charitable Commission of the Episcopate of Poland in Szczecin, the Director of which was Fr.Ireneusz Antkowiak . The aid was distributed to the needy. Advertising in TV, radio and the press. There was great interest and expressions of great affection for the Polish people in their plight. People sent money, brought clothes. We ourselves held auctions, had a sponsored walk in the mountains and I ran in a sponsored Mini-marathon which I find hard to believe now! We made our own Solidarity badges and car stickers. celebration of which was not permitted in Communist times). 8 May 1982-We visit Cork where a branch of the IPS has formed under the leadership of Eleanor McCann. We receive aid of clothes and medicines. Mrs.Rose-Marie Punch-Tarnowska, also involved in help, gives us hospitality. We bring 8 girls, who dance Polish dances. 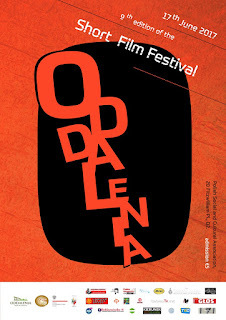 They are subsequently invited to many events to dance as there is intense interest in all things Polish. 30 May 1982 An Exhibition of Art organised by Pat Maguire in St. James's Hospital-room donated by the hospital for the event. August 1982. Fr.Antkowiak visits Ireland and meets members of the Irish Polish Society, ending his visit with a solemn Mass in the Pro-Cathedral attended by many well wishers. Food, clothes, medicines( sorted with the help of pharmacists).G.Ps gave medicines in response to letters in the medical press. We bought antibiotics in large quantities and received dressings. successfully lobbied all his friends for financial aid), Fr. Dermot MacNeice (we stored goods in the Servite Priory until they were put into containers). Fr. Dermot arranged a large supply of children's milk from Glaxo ; we had great support from Fr. Michael O'Carroll. We collected stamps and received in return money for aid to Poland from the Hibernian Stamp Company owned by Stefan Klincewicz. Firms: R.A.Burke, shipping agents; Bord Bainne; pharmaceutical firms; C.I.E. ; Tedcastle McCormick and Co. and the Coal Advisory Services and many more. How was the aid transported? R.A. Burke Shipping Agency, supplied us with Polish Ocean Line containers which were transported by the Polish ships Naleczow, Kwidzin, Wejcherowo, and Starogard Gdanski to Szczecin. In those times going on the ships was like going to a part of Poland and therefore very emotional. We made friends with the sailors; they kept us up to date with events and gave us traditional Polish hospitality; they also visited our homes and we in turn later visited them in Poland. Altogether we sent 20 containers to Szczecin in the early eighties. Later we sent smaller amounts through the Kent and Sussex Fund in England, run by Mrs. Helena Lesniewska and to other individual groups. In all that happened in those days our activities are like a drop in the ocean. But we were glad to have been a part of these historic events. Poland is now free but we must never forget those who paid a heavy price for this freedom some even with their lives - the coalminers in Wujek Coalmine and Fr. Jerzy Popieluszko. I would like to end with a poem to Fr. Jerzy by an unknown author, written in 1984 when Poland's future was still uncertain. for Warsaw and Poland hope. 'You were' - we must not say that. 'You are'- we must strongly believe in that. You are the living symbol of what is most beautiful in man. you tell us even to love those who are evil-when we are falling down in despair. You teach us to carry our cross and to believe in people. Now apparently alone we pray for trust. You are with us! You command us to believe in the victory of Good. We wait for your voice flowing from the altar. We wait for you. You are our hope.